ThermoCell | Tamar Laboratory Supplies LTD.
BIOER ThermoCell series all have digital control for time and temperature. A storage and programming capacity of up to five temperature profiles with five temperature steps allows for automatic change of temperature for various applications. There is no need to wait for the samples being ready and move them to a refrigirator for storage. Just program cooling after the heating process is finished. 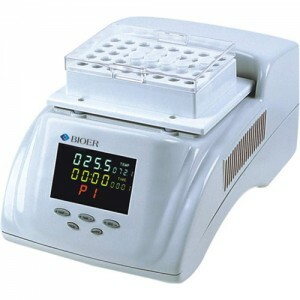 Interchangeable blocks covering tubes, plates or a water bath makes the units very versatile. Heave of the block makes block change easy and convenient. PID control can keep temperature in stable after it reaches setting temperature, which saves waiting time. Large LCD display ; intuitionistic operating panel for easy and convenient operationsetting temperature, actual temperature, setting time and running time display on the same interface. Multi blocks interchangeable provide a lot of test tube wells; and customized blocks are available according to the request of customer. With a special water bath block, the unit can be used as a water bath, which provides a free space for different kinds of tubes. Heating time: 20 – 100 °C in 12 min. Heating time: 20 – 100 °C in 35 min. Cooling time: 0 – 20 °C in 25 min. Time setting: 1 min – 99h59min.